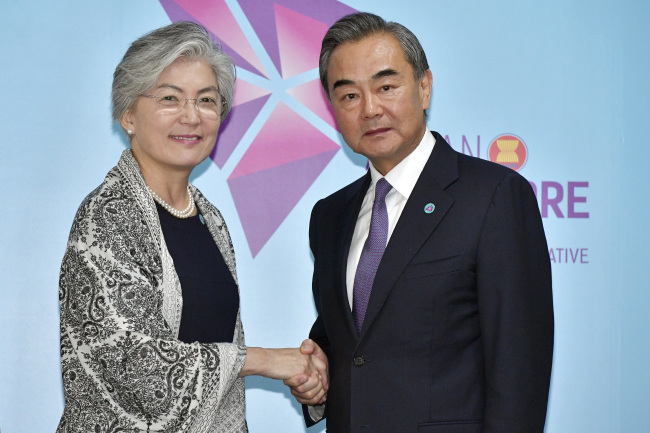 Chinese Foreign Minister Wang Yi asked South Korea on Friday to resolve the issue of an advanced US missile defense system deployed on the peninsula. Wang made the request in bilateral talks with his South Korean counterpart, Kang Kyung-wha, in Singapore on the margins of annual ASEAN-hosted sessions, according to a South Korean government official. He cited the need for a "compete resolution" to the matter, a repeat of Beijing's demand, which comes amid a peace mood in Korea. The US military sent a THAAD battery to a southern region of South Korea last year to counter the North's continued provocations at that time. China has fiercely opposed the so-called alliance decision, which ended up damaging bilateral ties diplomatically and politically. In response, Kang expressed hope that China will make more efforts to normalize its relations with South Korea, added the official. On denuclearizing Korea, the Chinese minister said an improvement in inter-Korean relations and Pyongyang-Washington ties is expected to lead to permanent peace in the region. Wang reaffirmed Beijing's support for the two Koreas' pursuit of declaring a formal end to the Korean War. Kang stressed that her government will continue a push for a consensus among all parties involved, as Washington wants to see more denuclearization steps first. The issue of international sanctions on Pyongyang was not raised in the talks, though, the official said on background.